The human survivors fall into a Cylon trap at Carillon. Read the complete synopsis of the three-hour "Saga of a Star World" at the Battlestar Wiki site. I borrowed the title of issue #3 of the BSG comic book by Marvel Comics for the title of this hour of Saga of a Star World. The talkative woman in the casino elevator is Carol Baxter, who played Mary in the Curse of Dracula segments of Cliffhangers! She also returns as another character on Battlestar Galactica in "The Lost Warrior". At 1:25:42 on the DVD, as Starbuck dumps his winnings on the cocktail table, one of the cubits falls off the edge, forgotten. Considering Starbuck's love of money, I don't think he would let a single cubit out of his sight unless he was spending it! As Apollo, Serina, and Jolly are escorted into the Ovion queen's chambers there is harp music playing in the background. It sounds like just background music on the soundtrack, but if you look closely, you will see that there are actually a couple of Ovions playing harps in the room. Apparently Colonial Warriors carry a Languatron device with them. Apollo uses one to translate the squeaking speech of the Ovion queen. The Languatron must be BSG's equivalent to Star Trek's universal translator. At 1:30:44 on the DVD, we see a Colonial flag in Adama's quarters. Another flag is visible in the pilots' barracks at 1:48:05. Adama comments in his journal that Carillon lies on the outer rim of the Colonial star system. Notice that at 1:31:22 on the DVD, the image of the Galactica moving past the camera is flipped...apparently we are seeing the long missing battlestar Acitcalag! After catching Starbuck in the casino with Athena, Cassiopeia tells him, "Next time, it's office rates, Lieutenant," before storming off. This is a reference to her previous profession as a socialator (prostitute). During Sire Uri's proposal to destroy their weapons and settle on Carillon, Adama points out that the Cylons had originally attacked the Colonies when the humans helped the alien Hasari, whose civilization was being taken by force by the Cylons. During Starbuck's conversation with the alien singer, two voices come out of her two mouths. The main voice is female, but the second voice is deeper and sounds male! The novelization refers to the singers as Tucanas and the original BSG writer's guide states that this is their species. Some BSG licensees refer to the girl Starbuck speaks to as "Android Sister". Are she and her cohorts intended to be interpreted as literal androids? Another possibility is that the term "android" is here used to represent "androgynous" rather than robotic. PopApostle reader Jace Toronto suggests that maybe the name of her group is The Android Sisters, a play on the famous singing trio The Andrews Sisters who performed 1925–1967, though he also points out that the BSG soundtrack album refers to them as The Space Angels. Notice that when Colonel Tigh sits down in the viper to have his secret conversation with Adama, the canopy closes without his having pushed a button to do so. Just a few seconds earlier, we saw that Adama did push a button to close the canopy of his own viper. When Starbuck and Boomer catch Colonel Tigh filching uniforms from the barracks, Tigh gasps, "Felger--", half of the Colonial swear word "felgercarb". At 1:41:22 on the DVD, the Ovion symbology for numbering the floors in the elevator appears to be based on ancient Mayan numerals. Just as seen here, Mayan numerals use dots to depict 1-4 and a bar for 5; then a bar with one dot above it would be 6, etc. At 1:58:58 on the DVD, we see an Ovion larva that has been feeding on the remains of a human body. At 2:01:34 on the DVD, Athena's screen gives us Cylon raider specifications. At 2:03:13 on the DVD, Apollo almost gets himself tangled up in his own cape as he hands Boxey off to Serina and turns around to help the humans flee the Cylons attacking in the casino. At 2:08:00 on the DVD, the shot of the Galactica is missing the ship's identification. A centurion speaks to a communications globe on Carillon at 27:02 in the deleted scenes. Here, we get our best look at the face of the Imperious Leader. A scene of Commander Adama and assembled crewmembers giving thanks for deliverance features a song (the Colonial anthem?) from 31:21-end. The words of the song are below. In Earth terms, the song seems to reference the story of the Book of Exodus from the Old Testament, in which the Hebrew people flee oppression in Egypt and journey across the desert for decades before finally settling in the holy land of Israel. The story of Battlestar Galactica could be said to somewhat resemble that of the Book of Exodus. In "Saga of a Star World" alone, there are several comparisons: the Hebrews fled the Pharaoh's tyranny in Egypt--the Colonials flee the Cylon tyranny in their solar system; the Pharaoh's troops pursue them--the Imperious Leader's troops pursue the fleet; God decimates the pursuing troops with the parting/closing of the Red Sea--the Cylon star force is decimated at Carillon, near the Nova of Madagon (depicted red in color) through which the fleet had to pass after disabling a mine field. Hail to thee, O lord of manna, bounteous be thy hand. Blessed be the core of freedom throughout the land. Keep us safe from powers of darkness, liberty and might. Man rejoices, land of Zion, lead us by thy light. We salute the cause of freedom 'neath our flags unfurled. Standing for eternal right through the star-wide worlds. According to the Old Testament, manna was the name of a food provided to the Israelites by God during their journey. "Zion" is a term referring to the holy land of the Jews. The scene above also shows some additional Colonial flags. Richard Hatch comments that creator Glen A. Larson changed the Cylons from being cyborg reptilians to being entirely robotic due to concerns by the television network (ABC) about the number of Cylons we see killed onscreen; substituting robots makes the kills "cleaner" because they're not really living organisms. Unfortunately, it also makes the Cylons less interesting. Richard Hatch mentions that the various collar pins worn by the Galactica personnel are actual pins worn by members of U.S. Army Intelligence. Pages 152-end cover the events of "Deathtrap"
On page 148, Starbuck comments that the Carillon casino is the biggest splash he's seen outside of Orion. In BSG continuity, Orion seems to be a planet which traded with the Twelve Colonies; it is later mentioned in both "The Magnificent Warriors" and "Murder on the Rising Star". Page 148 also gives the name of the casino on Carillon, Festival of Paradise. Page 150 reveals that Starbuck's favorite drink and dessert are a Sagittarian straight-arrow and Aquarian ambrosia cake. On page 151, Starbuck decides to play Hi-Lo at the casino. This may be a reference to High-Low Poker as played on Earth, a variation of poker in which the pot is split between the holders of the high and low hands. Page 164 suggests that the Cylons were not waiting for the Colonials to show up at Carillon, they were waiting at Borallus as Adama had predicted. A lone Cylon centurion stationed with their Ovion allies on Carillon alerted the Imperious Leader of the Colonials' arrival and the Leader dispatched his star force from Borallus to Carillon for an ambush. The book suggests that the Ovions drugged the food and drink in the resort to make the humans more susceptible to suggestion and muddy thinking. On page 193 Adama mentions the Lords of Kobol, even though Kobol is not mentioned anywhere else in the book. Pages 195-197 feature a scene not found in the episode in which Serina's reporter instincts cause her to question Seetol about the Ovions work and culture. At one point, she comments on the Ovions' apparently entirely female culture and asks if they reproduce by parthogenesis. She must mean "parthenogenesis", a form of reproduction, in some rare cases of species, in which females are capable of producing offspring without male fertilization. Seetol denies this, saying they have males for reproductive purposes, but that they have no place in their society after they have served that purpose. The writers were probably inspired by those Earth insect species in which the female kills (and often devours) the male after mating (such as the praying mantis). As Adama puts the Galactica on alert and prepares to spring a trap of his own on the Cylons at Carillon on page 199, he remembers a story from his childhood about a sleeping giant awakening. This is probably a reference to the quote attributed to Japanese Admiral Isoroku Yamamoto after the Japanese sneak attack on Pearl Harbor, "I fear all we have done is to awaken a sleeping giant," (though it is probable that Admiral Isoroku did not actually say anything quite like this). The reference in the book may be intended as another indication that Earth was the ancient homeworld that seeded the 12 Colonies (not Kobol as in the filmed version of the script) and WWII is part of that ancient history. Page 202 suggests that Cassiopeia's training to be a socialator also included many other disciplines and she won the highest academic honors. Page 203 suggests that Cassiopeia had a long, intermittent love affair with a Gemonese artist. She felt bad when she was not able to find him among the surviving refugees. Page 229 reveals that Cassie's father was the pilot of a freighter. Also revealed is the fact that she doesn't like to be called Cassie. Unlike in the episode, in the book, the Imperious Leader lives and finds that he has taken on the human desire for revenge, very un-Cylon. He determines to chase down the human fleet for as long as necessary to destroy the last remnants of humanity and torture and kill the hated Commander Adama personally. Notes from the comic book adaptation of "Deathtrap"
On page 16, panel 7, Boxey is depicted with blond hair. On page 17, panel 3, there is writing on the screen next to the Cylon. 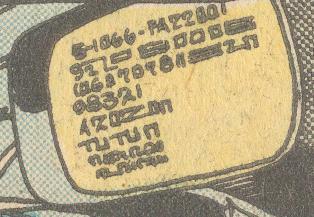 It appears to mix Arabic numerals with characters from a made-up alphabet. On page 27, panel 3, the Ovion larvae look like six-legged mammals instead of insects or grubs. Also on page 27, panel 3, Apollo calls Starbuck "Apollo"! Did Apollo, Starbuck, and Boomer receive their Gold Cluster awards? The ceremony is interrupted by a battle with the Cylons and Ovions.